Having fought out the finish of the past two renewals of the bet365 Charlie Hall Chase, connections of both State Of Play and Ollie Magern are aiming for another Wetherby rematch in the £65,000 Grade Three skybet.com Rowland Meyrick Handicap Chase, run over three miles and a furlong on the first day of the Yorkshire course’s two-day Sky Bet Christmas Meeting, Friday, December 26. State Of Play gained revenge over dual bet365 Charlie Hall Chase winner Ollie Magern in last month’s Grade Two contest with a hard-fought length victory and trainer Evan Williams is looking forward to seeing his star eight-year-old return to Wetherby as he bids for a course and distance double. Williams commented: “We are definitely looking at running State Of Play in the skybet.com Rowland Meyrick Handicap Chase. He’s entered in the Welsh National but we have been to Wetherby twice before and he seems to really enjoyed the place so I would prefer to see him line up there on Boxing Day. “It’s obviously very special to win a race like the bet365 Charlie Hall Chase. I was over the moon with the way he battled in the run-in. I have such an enormous amount of respect for Ollie Magern, especially as he was carrying all that weight this year, but we were in the same situation 12 months earlier. “We actually entered State Of Play in the skybet.com Rowland Meyrick Handicap Chase last year but I got a little bit carried away and wanted to run him in Ireland, which was probably the cause of his downfall last season. A trip to Yorkshire seems far more appealing this year than a trip over the Irish Sea! “He has had a break with his owners’, Mr and Mrs Rucker, and he seems a very happy horse at the moment. He looks very fresh, which is the key to him, and I think this season we will give him a break between each of his races. “He’s a horse that doesn’t need to be rushed and we always wanted to run him in the bet365 Charlie Hall Chase and then hopefully give him a race over the Christmas period and perhaps one or two runs in the spring. He’s won a Grade Two on his first run of the season and, obviously it’s a massive feather in his cap, so whatever he does from now on is a bonus. After bet365 Charlie Hall Chase successes in both 2005 and 2007, trainer Nigel Twiston-Davies was disappointed that Ollie Magern was unable to gain a hat-trick in this year’s race, but the Naunton-based handler reckons that a return to handicap company will play into the hands of his course specialist, who was also victorious in the Grade Two Towton Novices’ Chase at Wetherby in February, 2005. Twiston-Davies said: “Ollie Magern has been entered in the King George VI Chase but he is far more likely to contest the skybet.com Rowland Meyrick Handicap Chase instead. 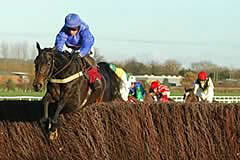 He’s got fantastic form at Wetherby and I would prefer to run him there as opposed to Kempton. “It was obviously disappointing to get beaten by State Of Play in the bet365 Charlie Hall Chase but he still ran a good race, especially considering the amount of weight he was giving away. “You would have to say that he would have more chance in the skybet.com Rowland Meyrick Handicap Chase because it is handicap and I would be hopeful that he could beat State Of Play with a 3lb pull in the weights. The skybet.com Rowland Meyrick Handicap Chase has a rich tradition of attracting some of the top staying chasers, previous winners include Gunner Welburn in 2003, who finished fourth in the Grand National the same year, and Cheltenham Gold Cup runner-up Truckers Tavern in 2004. Sponsored by Sky Bet for the seventh year, the Sky Bet Christmas Meeting offers two days of superb racing action. Besides the Grade Three skybet.com Rowland Meyrick Handicap Chase, the six-race card on Boxing Day, Friday December 26, also includes the £10,000 Merry Christmas From Sky Bet Handicap Hurdle (2.15pm) and the £12,000 skysports.com/super 6 Handicap Chase (2.50pm). The second day of the Sky Bet Christmas Meeting hosts the prestigious £30,000 skybet.com Castleford Handicap Chase (3.30pm), a two-mile contest which has stayed in Yorkshire for the past two seasons courtesy of the Malcolm Jefferson-trained Calatagan. The £12,000 skyvegas.com Novices’ Chase (2.25pm) and the £10,000 skypoker.com Introductory Juvenile Novices’ Hurdle (3.00pm) also feature on the six-race card, with all three contests being shown live on Channel 4.